Ganoderma applanatum is a very common perennial bracket fungus. 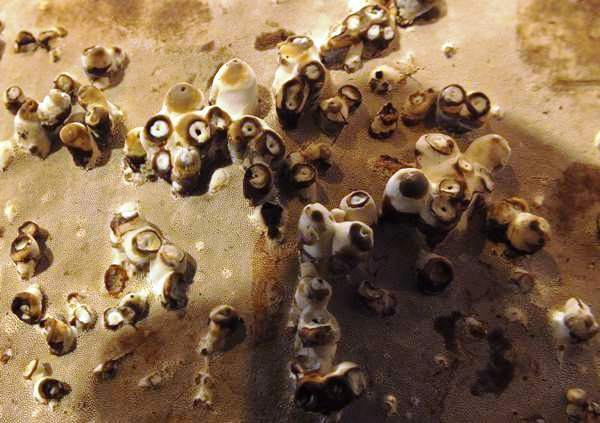 The underside is creamy white and can be scratched with a sharp point to leave brown marks and so produce artistic images - hence the common name. This tough bracket lives for many years, developing noticeable annual growth ridges on the upper surface. If you cut through a bracket you will see layers of tube pores - the number of layers gives a clue to the age of the fruitbody. When it releases spores it does so in their billions, and so this large bracket fungus colours the surrounding area with dense brown dust. The Yellow Flat-footed platypezid fly Agathomyia wankowiczii creates distinctive galls (as illustrated in the picture on the left) on upper and/or lower surfaces of Ganoderma applanatum. Whenever you find a bracket with these galls, any doubt you might have as to whether it is Artist's Bracket Ganoderma applanatum of the very similar Southern Bracket Ganoderma australe should be dispelled immediately: these flies are very fussy and selectively colonise only Artist's Bracket. 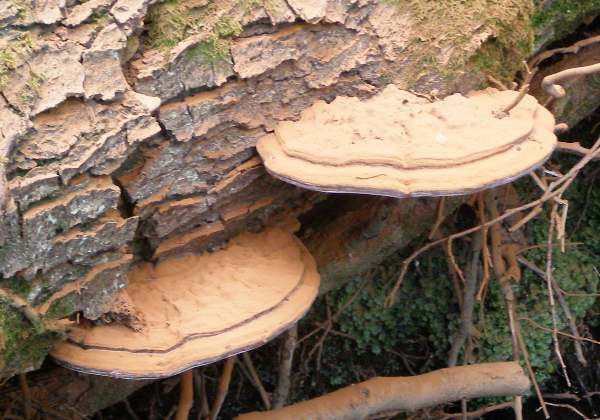 Widespread and fairly common in Britain and Ireland, Ganoderma applanatum is found throughout most of mainland Europe and is most common in central and northern Europe. Described in 1800 by Christiaan Hendrik Persoon, who gave it the binomial scientific name Boletus applanatus, this polypore was transferred to the genus Ganoderma in 1887 by the famous French mycologist Narcisse Theophile Patouillard (1854 - 1926), thus establishing its currently accepted name Ganoderma applanatum. Synonyms of Ganoderma applanatum include Boletus applanatus Pers., Polyporus applanatus (Pers.) Wallr., and Fomes applanatus (Pers.) Gillet. Shining skin is the literal translation of Ganoderma, which comes from the Greek words Ganos, meaning brightness (or shining); and derma, meaning skin, although not all Ganoderma fungi have particularly bright shiny surfaces. The specific epithet applanatum means of a flattened (planar) shape. A common sight where trees fall and are not harvested, this large bracket fungus usually occasionally in tiered groups at the base of trees, particularly oak and beech but also on conifers, and more often on fallen or felled trunks and large branches. 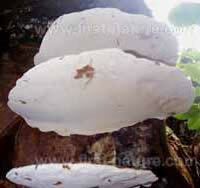 15 to 50cm across and 5 to 10cm thick, the fruiting body has an off-white margin and a brown top. The tubes are up to 12mm deep. The small round pores, typically five per mm, are white when the fruiting body is young, turning brown with age or when bruised. Ellipsoidal to ovoid, truncate at one end, smooth, 6.5-8.5 x 4.5-6μm. A 'mushroomy' odour and a bitter taste. Parasitic/saprobic, on dying tree trunks and quite often on felled trunks, nearly always of hardwood trees. Perennial but releasing spores in late summer and autumn. 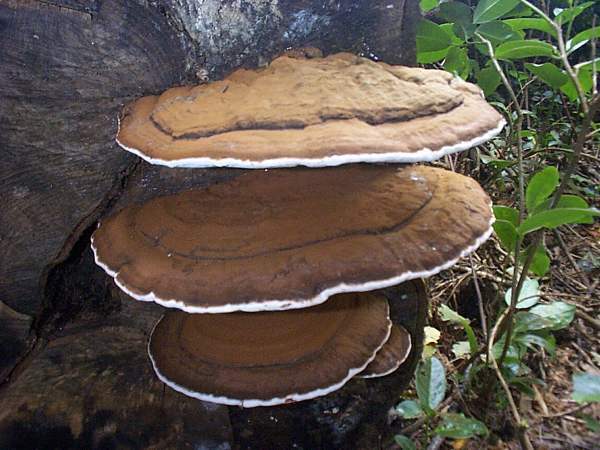 Ganoderma resinaceum, which releases a yellow resin when broken, has a much thicker white margin than Ganoderma applanatum. 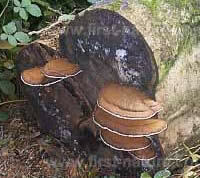 Ganoderma australe has a darker upper surface, is usually much thicker, and has slightly larger pores and larger spores. These bracket fungi are far too tough to be edible.